San Diego attracts over thirty-three million tourists each year with a long list of first rate attractions and near perfect weather. 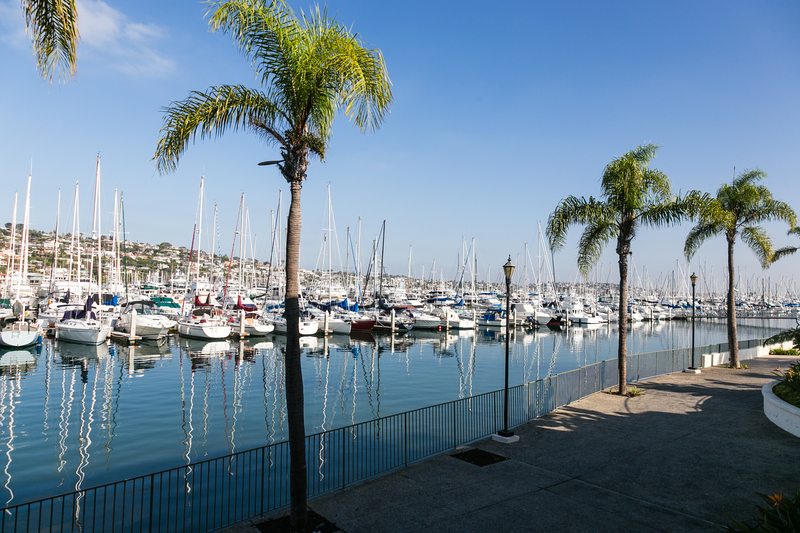 The Southern California destination is enhanced by a natural deep-water harbor, extensive beaches, and a long association with the U.S. Navy. With annual average highs between 64-76 degrees and average lows from 48-62, visitors are almost assured ideal weather any time of the year. My trip started with a cross-country flight to San Diego International Airport and a short taxi ride to Shelter Island, less than ten minutes away. Shelter Island began as a sandbank in San Diego Bay, visible only at low tide, but is now connected to the mainland by a narrow strip of land. The area maintains an understated park-like atmosphere with a nautical theme; no glitzy high-rise buildings here, just upscale resorts, marinas and boats, boats and boats. 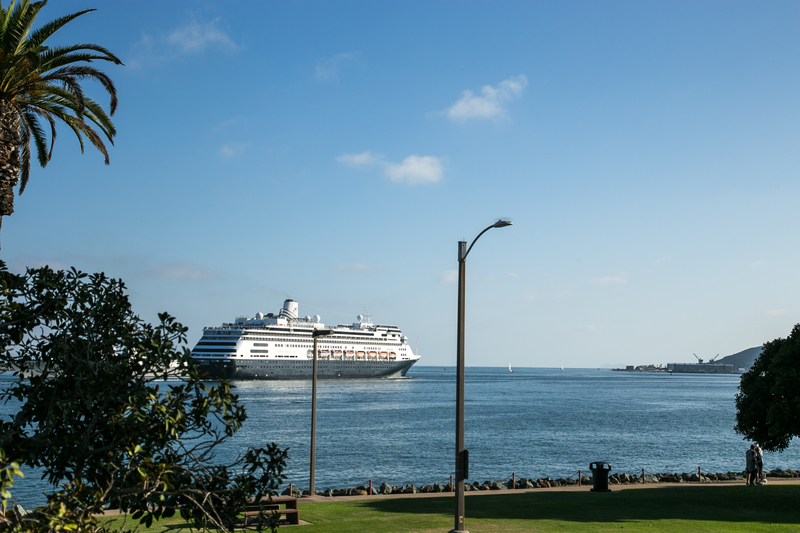 A popular shoreline walking and cycling path attracts exercisers with surprising views of passing naval carriers and cruise liners, so huge that folks stop and stare. I checked in at the newly renovated, two-storied Kona Kai Resort, and found my way to an oversized, airy room with sliding glass doors leading to a private balcony with an ocean view. This became my favored spot for morning coffee or an afternoon cocktail. Actually, all 129 guest rooms in the sprawling resort have balconies with marina or ocean views, along with amenities such as in-room refrigerators, coffee makers, flat screen televisions, I-Home radios and high speed internet. The hotel is 100% smoke-free. Unless you’re Donald Trump, the Kona Kai Marina will make your jaw drop in awe; it’s home to some of the swankiest yachts in the world. Kona Kai boasts the only privately owned beach in the state, which further boosts the place. I started my day with sand under my toes, while fresh ocean breezes passed my nose. I was beginning to understand the outdoorsy Southern California draw. Another view of the Marina. Boredom was not an option; on-site recreation runs the gamut from carefree lounging in poolside cabanas, lap swimming or soaking away stress in the hot tub. 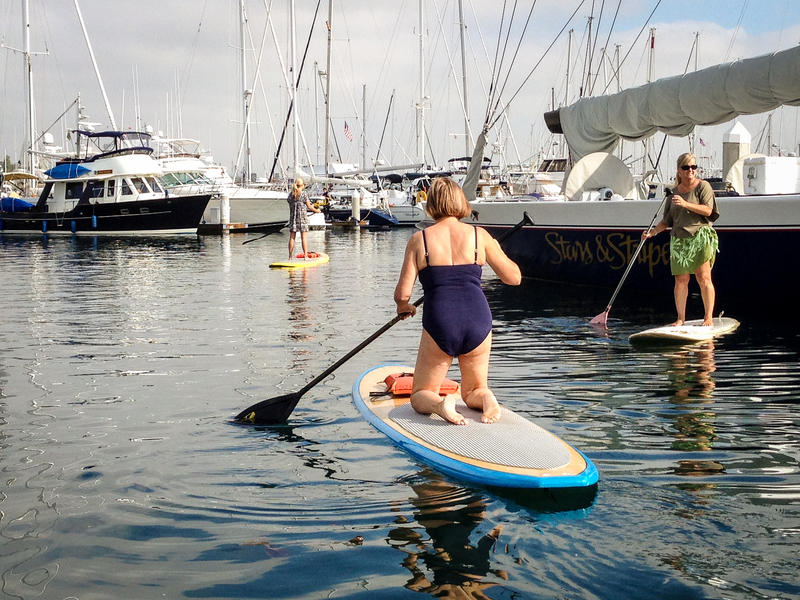 Guests can rent jet skis, kayaks, canoes and paddle boards with lessons at the marina dock. What the heck? I decided to try stand-up paddle boarding for the first time. 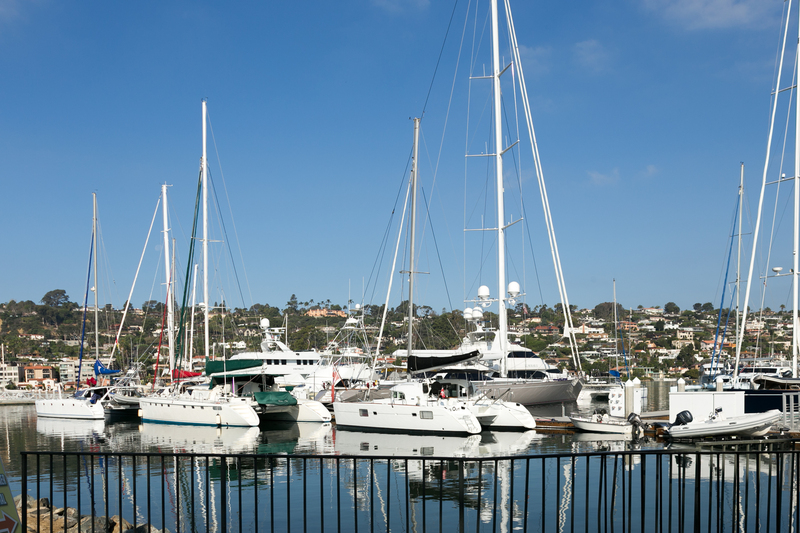 Luckily, the secluded harbor is bathed in calm water, the ideal setting for beginners. Kneel before standing up on a paddle board. My instructor said to mount the surfboard-like plank on my knees, which I did right off the edge of the dock. I paddled out a few strokes and then, with the board wobbling underneath me, I very carefully stood up while trying to diminish the imbalance. I somehow managed to keep afloat, but am sure I looked a bit like a drunken sailor. I began to stroke with one oar; voila; how invigorating to glide over the water from a standing position. For those old enough to remember, I envisioned myself as the Norelco Santa, sliding smoothly and easily along. 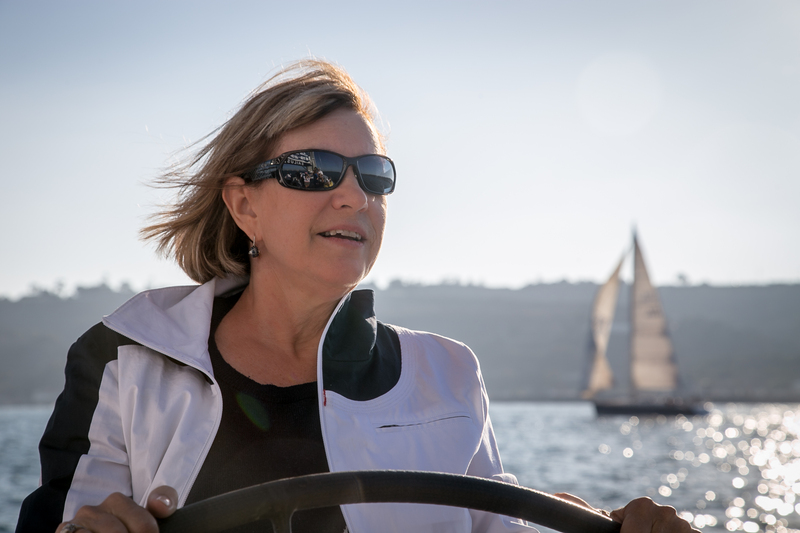 I paddled past gorgeous yachts, moored in their sleepy berths, and basked in the sunshine warming my body. Yikes, I realized I had to lie down to fit under a pedestrian bridge, as it was high tide. Miraculously, I lowered my body to my knees, and then edged into a prone position. After gliding under the bridge, I teetered back up without falling into the water. I discovered the sport exercises your abdominal and arms muscles while presenting a scenic take on the world. One of the super boats docked in the Kona Kai Marina is Stars & Stripes, USA-11, the authentic 1992 America’s Cup Racing Yacht. 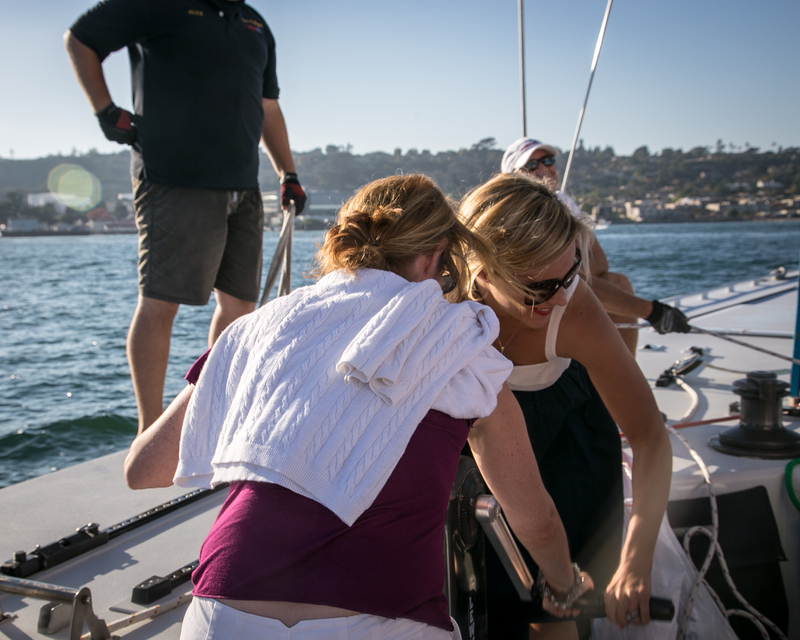 Captain Lynn Hanna and his crew can welcome up to 24 guests for a three-hour sail. 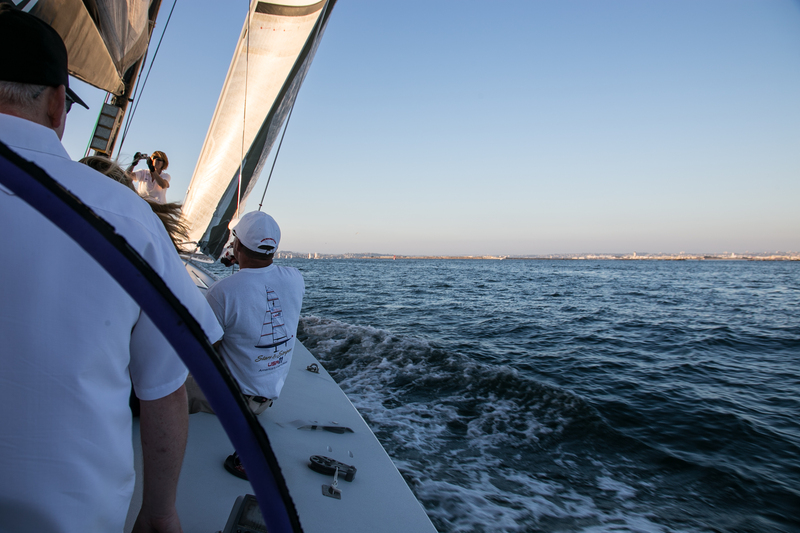 This adventure is rated as the #1 attraction in San Diego by Trip Advisor, and will become a rush of memories for anyone taking the sail. 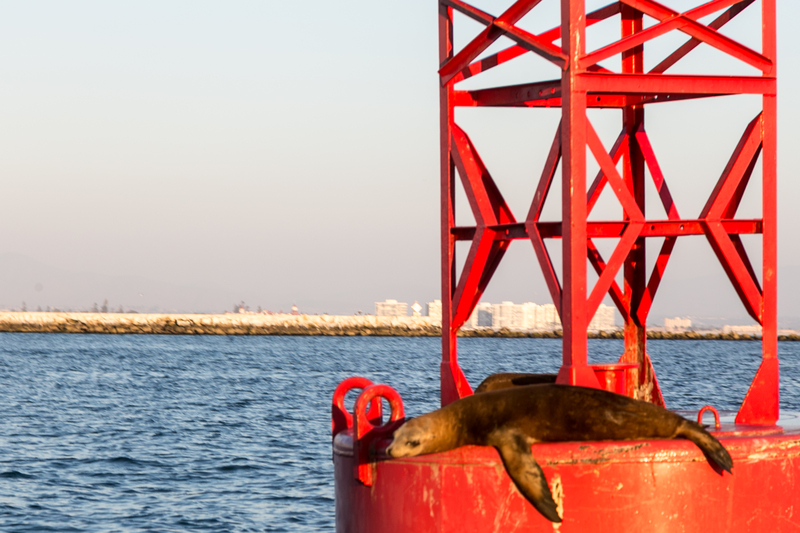 Late one afternoon, I was given the opportunity to board Stars & Stripes and head out toward Point Loma, passing harbor seals lounging on marine buoys and into the Pacific Ocean. Volunteers are encouraged to assist, as six able bodies must grind winches to raise the mainsail, a massive 3,500 square feet Carbon Fiber 3DL beauty. I agreed to help, but admit growing tired by the time the sail was hoisted into position. 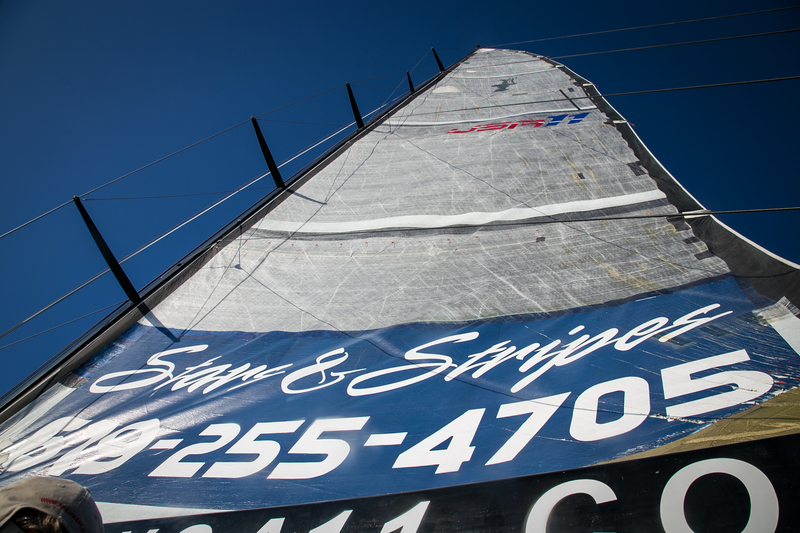 Each time the sail was tacked, the boat would list left or right, adding to the thrill. Later, I took a turn at the helm, feeling the power of this magnificent vessel as it cuts through the water. When we turned around and headed back, a distant view of the San Diego skyline became emblazoned in a golden sunset. While I’m not an angler, numerous boat charters leave Shelter Island for offshore fishing trips. Options run from a half day to full day trips deep out into Mexican waters. Feeding a turtle at the San Diego Zoo. The San Diego Zoo justifiably earns its world-famous reputation as one of the finest zoos in the world. 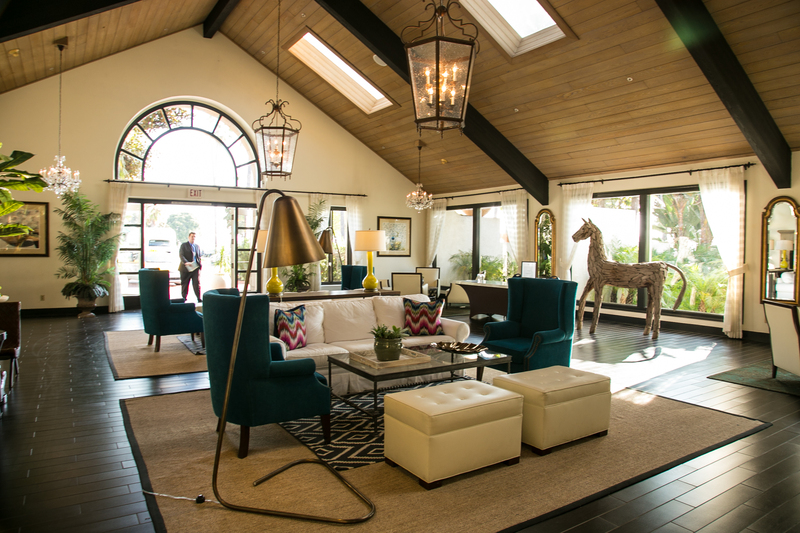 A daytime VIP tour is always a winner. 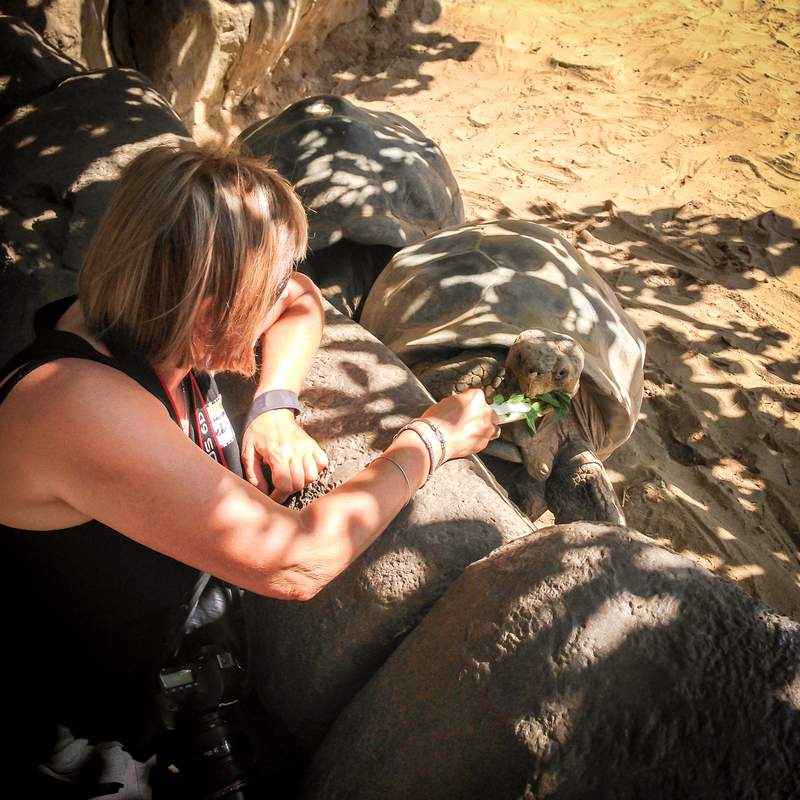 The VIP ticket includes up-close experiences and behind the scenes activities, like hand-feeding lettuce to a giant tortoise and giraffes. Between stops, participants hop onto oversized golf carts driven by tour guides, saving them hundreds of steps in the park. It’s impossible to see all 3,700 animals in one visit, but my group was given speedy entrance to the popular giant panda exhibit, where those adorable creatures were asleep in the trees. 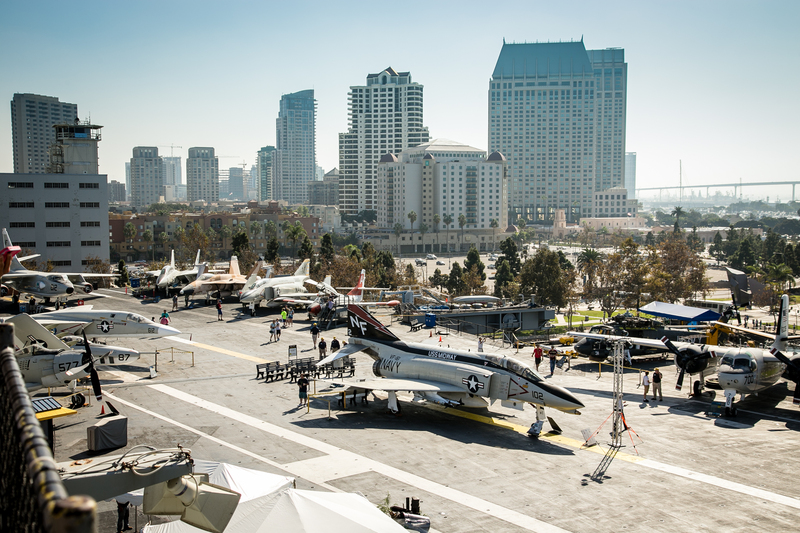 San Diego hosts the largest naval fleet in the world, and touring the USS Midway Aircraft Museum becomes a fitting tribute and eye opening education. This aircraft carrier served longer than any other ship in the 20th century, from 1945 to 1992. Tourists should be ready for lots of walking, as this ship is immense. Many former sailors live in Southern California and volunteer as guides. They can’t wait to describe their former shipboard life, and lead groups through sleeping quarters, engine room, galley, bridge, officers’ quarters, flight control center and the pilot’s ready rooms. 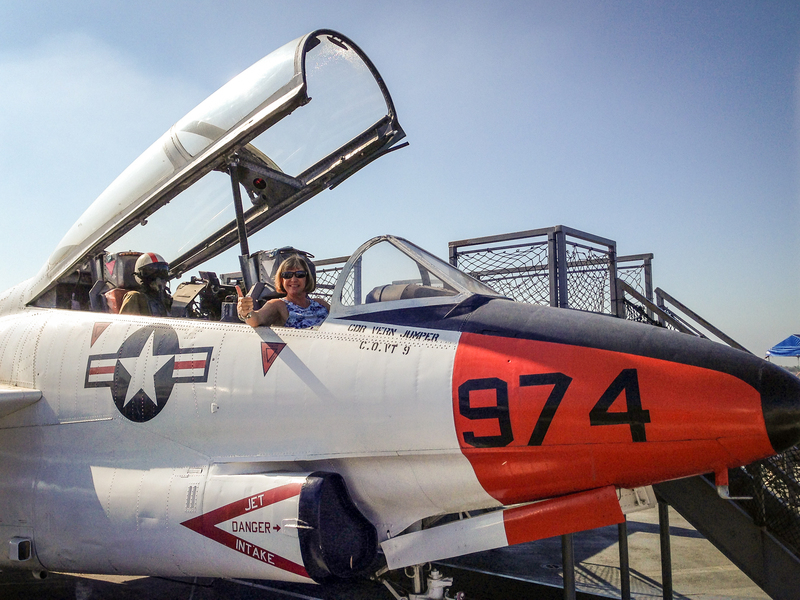 I hammed it up on the flight deck by climbing into an aircraft cockpit and posing by some vintage planes. Guides were on hand to explain the precision maneuvers needed to successfully launch and land planes from that strip. These difficulties help you understand and appreciate efforts of the military. San Diego has been called “America’s Craft Beer Capital” with 87 area breweries. A brew hop with tastings along the craft beer trail makes a fun afternoon or evening activity. 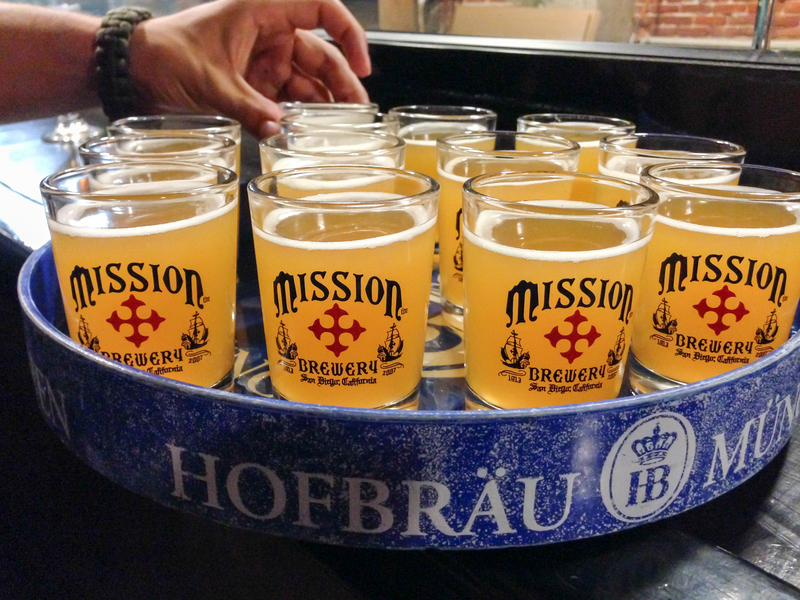 I stopped into Mission Brewery, where I tasted their various ales. The proprietor allows guests to bring in food to pair with their beer. I saw lots of pizza boxes around the room. The food scene in San Diego is truly hot, influenced by nearby Tijuana and spicy Mexican flavors. 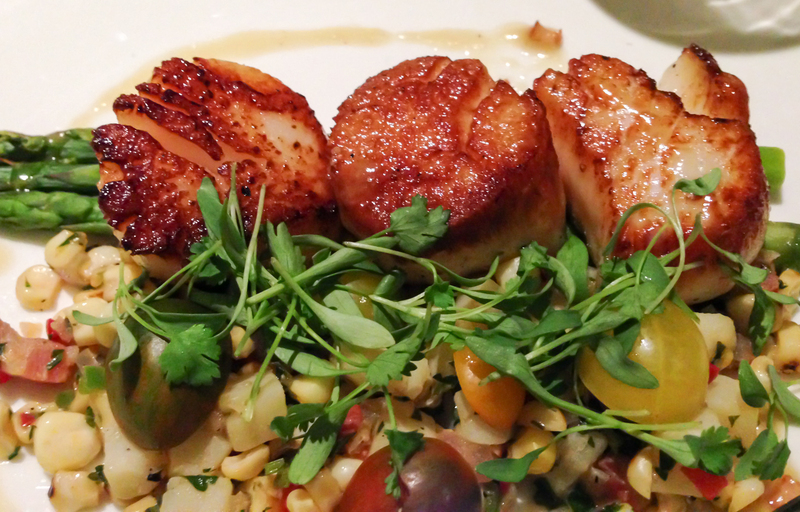 Talented local chefs serve up fiery dishes. 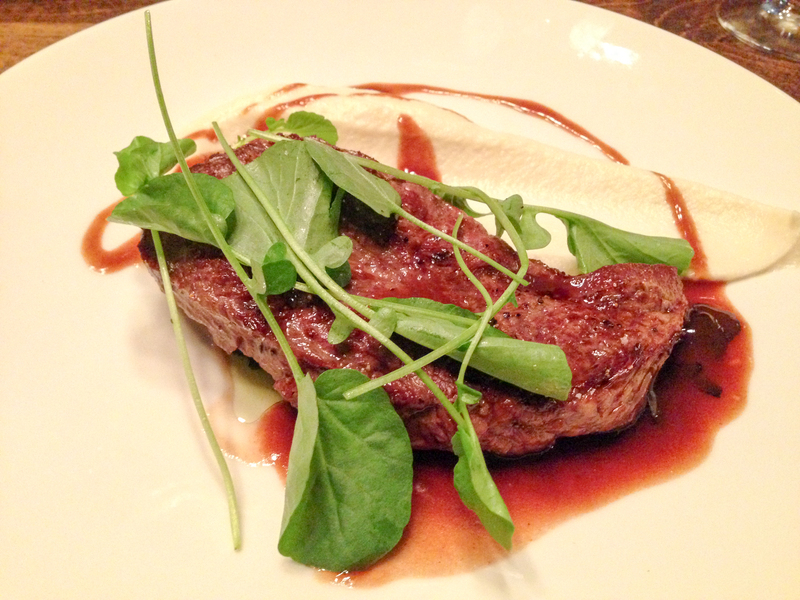 I enjoyed ethnic fare at downtown restaurant, The Blind Burro, and Italian at The Venetian, in the suburbs. The So-Cal healthy food movement is also prevalent. 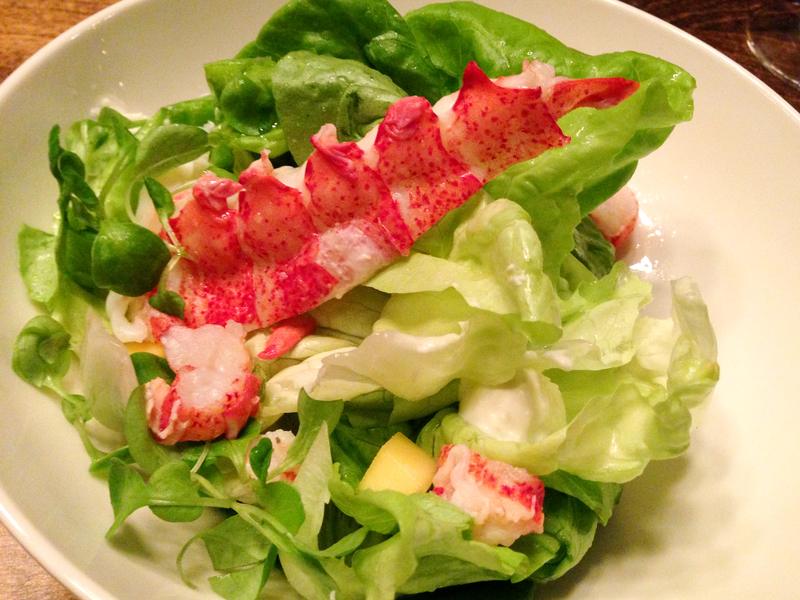 My meals at Kona Kai were beyond typical hotel food. Dishes were photo-worthy presentations that tasted delicious and yet were still healthy, even my gluten-free options. 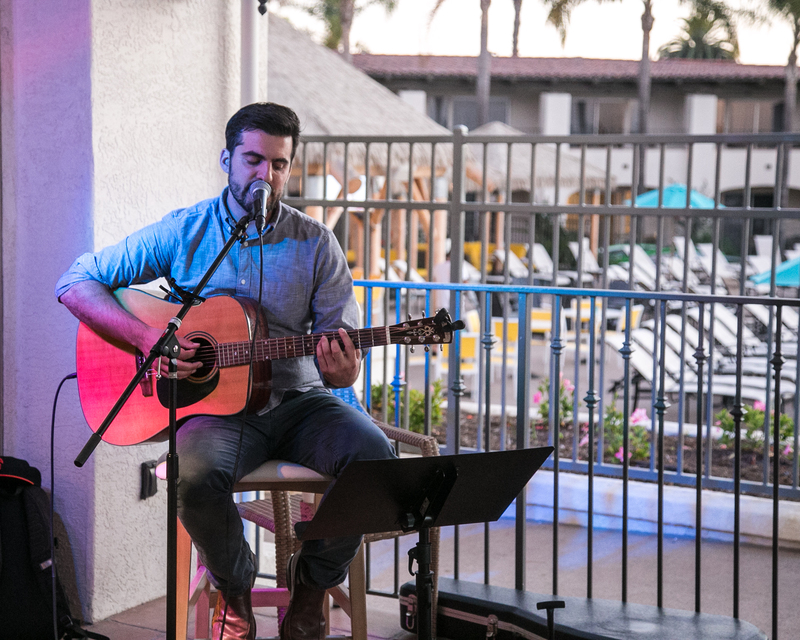 Live Music at the Kona Kai. While I didn’t have time for the beaches, sunny San Diego is indeed a crowd pleaser, and I can understand why it is one of the fastest growing cities in the nation. The long standing and much loved, but renovated, Kona Kai has never been better, and I definitely recommend spending some time there.